We head up towards the Tibetan border to raft two days of continuous whitewater on the main tributary of the Sun Kosi. Smooth cliffs squeeze the luminous blue water between giant boulder gardens. Hard-rock strata chokes the narrow riverbed, forcing the flow down a convoluted maze of threadlike plunging passageways. Dodging down intricate routes, our rafts thrusts through, often with only inches to spare in the constricted chutes. The rafts buck wildly through the foaming fury, accompanied by shrieks of approval from the crew. There's is time to explore and enjoy the grandeur of this borderland as we carve our way through these rugged mountains. We stay in an exclusive tented camp with a well-stocked bar. A trip down the Bhote Kosi proves to be the weekend of a lifetime. 01 Early morning drive to put-in point near the Kodari border (4 hrs); paddling demonstration & safety talk; start rafting. Take our before Barabise and drive back to camp. 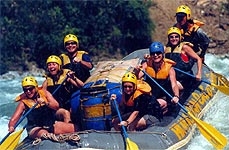 02 Finish rafting at Lamosangu mid-afternoon; drive back to Kathmandu after lunch (3 hrs), arriving early evening.